I’ve never run so fast in my entire life. 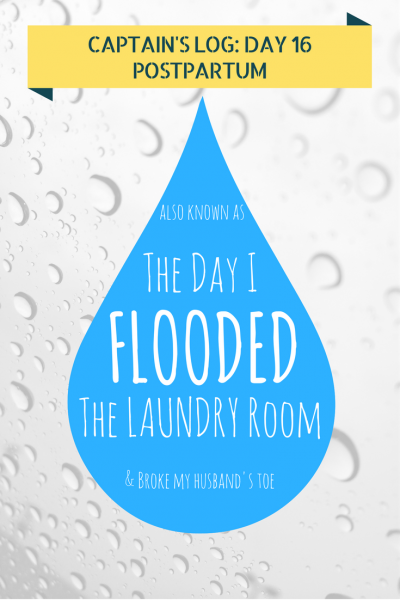 I slammed my arm into the wall as I ran into the laundry room which was, no lie, full of 2 inches of water, with the sink overflowing like a waterfall. (I so wish I would’ve taken a picture.) In some order I cussed, turned off the faucet, plunged elbow deep into the sink to pull the stopper, and ran around for every towel I could carry. A few minutes later it was all cleaned up, and all the wet towels, rugs, and laundry were piled on the countertop and draining into the giant sink. My heart rate slowed down enough that I could think clearly. I silently prayed while I looked for any water damage. I took inventory of the downstairs level: dining room ceiling, dry. Bathroom ceiling, dry. Kitchen ceiling, dry. Whew. And, from my super patient, gracious husband: “It’s okay. It’s not your fault. Accidents happen. My toe just hurts.” Later, after lots of ice and Motrin, we talked about a water alarm (so that it doesn’t happen again), and the fact that even though I’m feeling good physically and emotionally, I’m still easily distracted. Now as a mom of two, I have the potential for even more distractions. Perhaps multitasking will never be my forte. I haven’t been back in the laundry room in 2 days — I’m a bit gun shy now. Did I learn my lesson from this? I hope so. I’m not exactly sure what takeaways I have yet except for embarrassment and frustration. Have you done anything like this? Any other moms of littles out there find any ways to combat the momnesia? What are your secrets? I can’t get out of doing laundry forever!